June 04, 1998, L. G. Crabo. 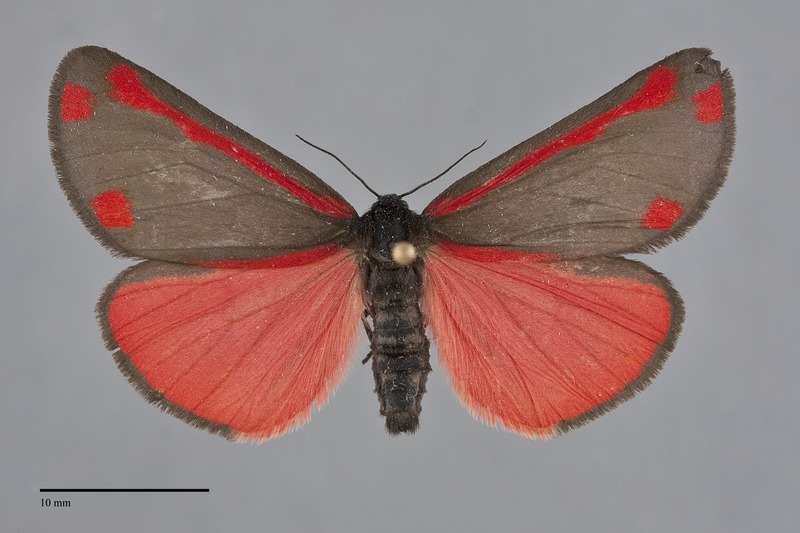 Tyria jacobaeae, the Cinnabar Moth, is a bright red and black moth found in the western part of the Pacific Northwest. It is medium-sized (FW length 16–21 mm). 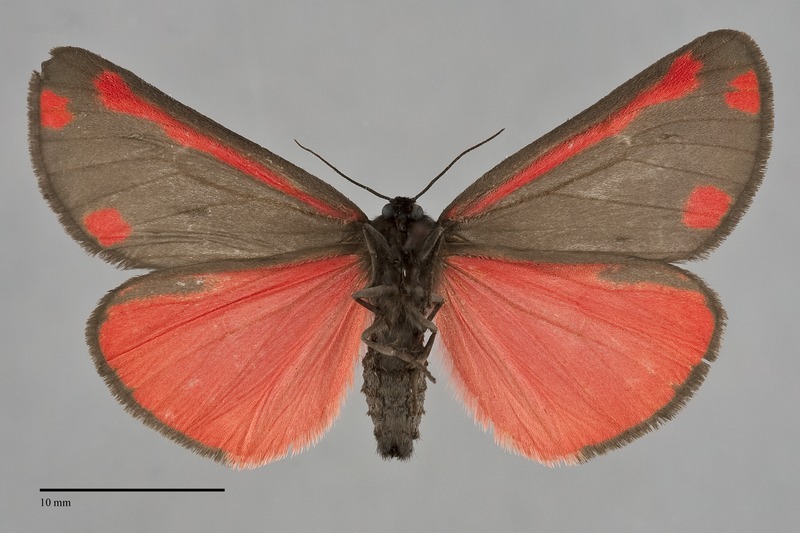 The forewing is black-gray with a bright red line parallel to the anterior margin and two red dots near the outer margin. 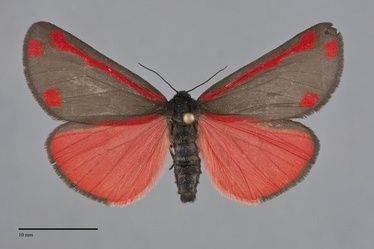 The hindwing is solid red with black at the anterior margin and fringe. The antennae, head, and body are black. This striking moth is unlike any other species in our area. Larva is relatively smooth with only sparse hairs, and has alternating orange and black bands. It is illustrated by Miller & Hammond (2003). This species is widely distributed in Eurasia, and has been introduced into the Pacific Northwest as a biocontrol agent for exotic tansy ragwort, a noxious weed in agricultural areas. It is common west of the Cascades in coastal grasslands, Willamette Valley grasslands, and even subalpine meadows at high elevations in the Cascades. T. jacobaeae is found almost exclusively west of the Cascades from southwestern Oregon to southwestern British Columbia. An isolated record is from the Blue Mountains in northeastern Oregon. This species might continue to spread east of the Cascade Mountains. This species is native to Eurasia. It is limited to the Pacific Northwest in North America. This species is a foodplant specialist on exotic tansy ragwort (Senecio jacobaea), a noxious agricultural weed, but will feed on some other species of Senecio such as the native S. triangularis in high mountain meadows. Adults are both diurnal and nocturnal. Most specimens are collected by hand netting but it also comes to light. It flies from early May until early August but is most common in spring and early summer.